Martha Whitehead was the family story-teller in the past. I suppose I have taken up her charge. I believe these stories give us not only a glimpse of the times in which they live, they also give us some insight into the people themselves. Since it is beginning to feel like fall, I chose this story today. Recall, these are not my words, rather Martha Whitehead Moore. I am posting them here so we can all share them. Sandy Cross is a generous community. Everyone shares. Grandpa’s (Gus Stevens) syrup mill served the entire area. 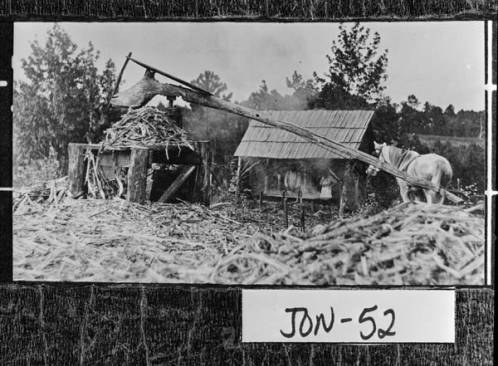 When sorghum cane was ripe, people used to sign up for a day’s use in the Fall. “We” were the only ones who had a ribbon cane patch, and Grandpa had “Hop” Appling to cook his syrup. “Hop” cooked for most everyone. We grandchildren would get up early to watch the mule pull the grinder around and round to squeeze the juice from the cane. We drank a little juice, but it was not as good as the syrup! A pan, about 10 feet long was divided into sections by pieces of tin 6 inches high. The sections were open at the end – every other one open on a different side – so that the syrup could be moved to cook evenly. It was pushed and pulled with a hoe-like contraption attached to a long handle. Under the pan there was a bed of hot oak coals. When it was done, “Hop” would let us sample it – with hot, buttered hoe cake. Grandpa didn’t charge for the use of the mill but each family brought its own wood and cleaned the place thoroughly after use. This story has an individual you might not know. “Hop” Appling was a tenant farmer on the Stevens land. I have “met” via this blog, a relative of his, Sheila Appling. Her Mother and Aunt lived on the Stevens land. I am not sure what relation Hop was to Sheila. Sheila, if you know, please let me know. Can you all taste that syrup in your mind? I can. I love the way Martha wrote her stories. The images jump of the page. I found a few images online that give us an example of this story. But, I can also imagine the little children waiting their turn for this tasty treat. 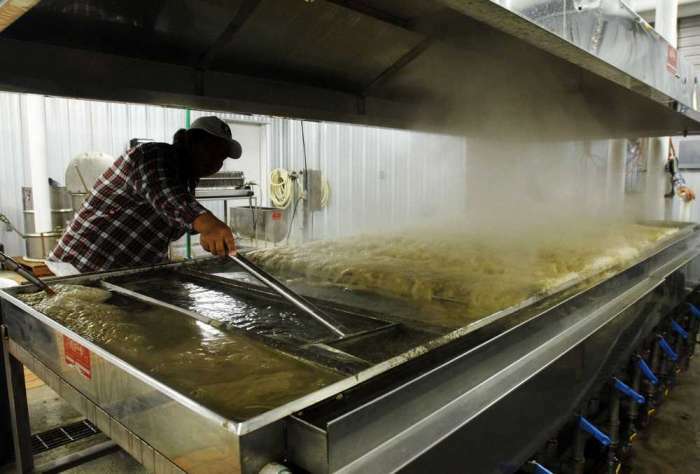 Source: http://jacksonville.com/news/georgia/2014-12-06/story/odum-couple-uses-modern-equipment-turn-out-old-fashioned-cane-syrup, Retrieved on 10/16/15. Mule pulling grinder for syrup. Until next time when we explore backwards.